When creating any of these blocks, we have to specify both alpha and beta. But what should these values be? What relationship do they have to each other, or, indeed, the physical properties of the control loop? Well, that's not easy to understand or explain, and because of this, it's not the right way to build these algorithms. So now we just have to know what damping factor and bandwidth we require from our loops. Of course, right now it seems like we've just translated from one set of unknowns to another set of unknowns. But at least we can better explain this new set. In fact, we're going to break it down so that we only specify one of those numbers. 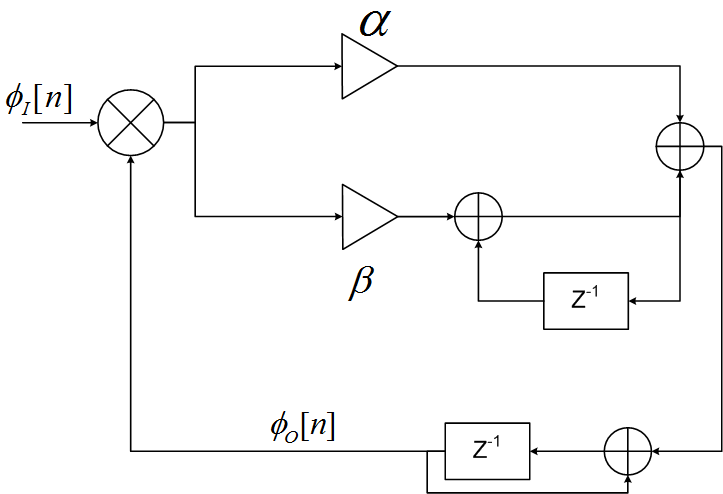 In control systems, the damping factor specifies the oscillation of the loop, whether it's under, over, or critically damped. In a normalized system, a damping factor of 0.707 (or the sqrt(2)/2) is a critically damped system. This is a good approximation for most systems, so we can just set it and forget about it. So now, we just have to set a loop bandwidth. This is a bit more difficult, but as a rule, this value should be somewhere around (2pi/100) to (2pi/200), so we can work around there. If we're trying to optimize the behavior of our system, it's now a hell of a lot easier to work with a single value instead of two. Just to be complete about the whole thing, though, as I have been reworking all of these blocks, I have also been adding set and get functions for every value. So while the constructor only needs us to give it the loop bandwidth, we can also change the damping factor if there's a particular need to do so. We can also individually change alpha and beta, still, if really want to. In the previous post on this topic, I was discussing how to set the gains of the control loop inside our various signal recovery blocks (PLLs and the like). The control loop looks like the following figure, where the alpha and beta blocks are the gains that we want to set. I then laid out a formula that describes how to derive these values from the more standard concepts of the natural loop bandwidth and damping factors. Instead of just tossing those equations out there, I thought I would provide a derivation for how we get there. Unfortunately, HTML is a horrible language for working in math. So I created the derivation separately and converted into both HTML and PDF formats. I especially want to thank fred harris for his help in the steps to go from the z-domain to the s-domain so that I could connect the dots to put alpha and beta in terms of zeta (the damping factor) and theta sub n (the natural frequency of the loop).